Stop Slavery Hotel Industry Network – Combat human trafficking and modern slavery within the sector. What is The Stop Slavery Hotel Industry Network? The Network brings together representatives from across the hotel industry to combat human trafficking and modern slavery within the sector. Its ethos stems from the acknowledgement that actors across the industry, whether international brands, bespoke hotel groups, independent owners, managers or employee agencies are all responsible for combating this horrific crime. On 9 March 2018 at the event “Collaborating to Tackle Human Trafficking and Modern Slavery” at UN Women Headquarters in New York, the Network launched a ‘Framework for Working with Suppliers: Mitigating Risk of Modern Slavery’. 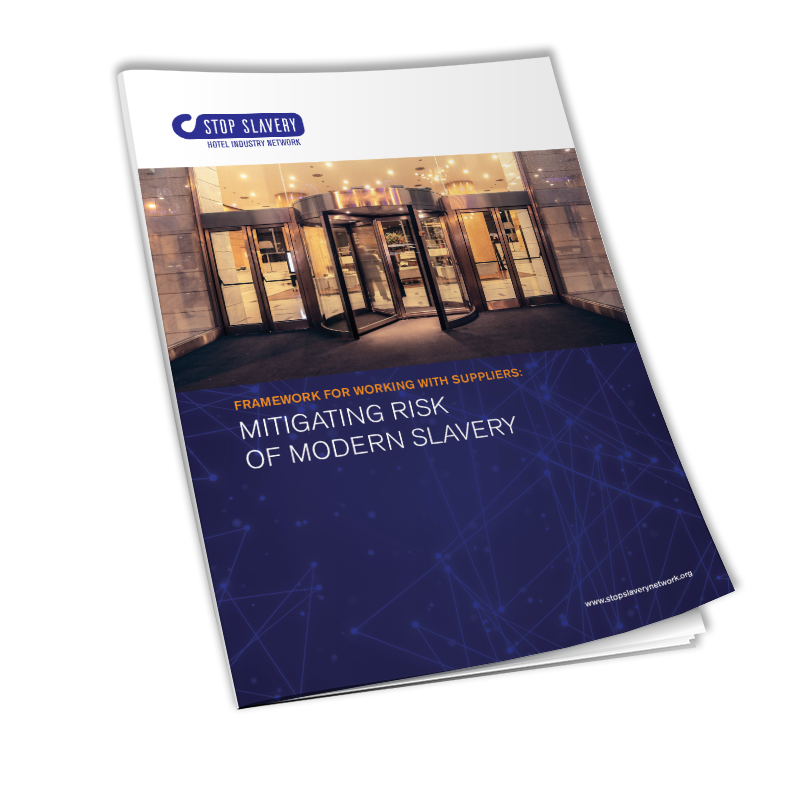 The Framework focuses specifically on how stakeholders within the hotel industry can work with suppliers to address and respond to risks of modern slavery within their businesses. It is a tool meant for various levels of management within the industry and is in line with existing advice and guidance on addressing supply chain transparency and engaging with suppliers in business. “Late check-in, no luggage, child in tow – signs of slavery?” Thomson Reuters Foundation News, Jul 2017. “Network Launched to Combat Modern Slavery in the Hotel Sector” eHotelier, Nov 2016. “How the Shiva Foundation Hopes to Stop Hotels Supporting Slavery” Travindy, Apr 2017. “Hotel Industry Leadership to Tackle Modern Slavery” Forster Communications, Mar 2017. “New Hotel Industry Network Launched to Tackle Problem of Modern Slavery in Hospitality Industry”Travindy, Dec 2016. “Stop Slavery Network Formed By Hotel Industry” Ethical Performance, Dec 2016. “Working Towards an Industry-Wide Commitment to Tackle Modern Slavery”Hotels and Traveller, Oct 2016. “Network Launched to Combat Modern Slavery in the Hotel Sector”Shiva Foundation, Nov 2016. “Major UK Hotels Hilton, Shiva Join Fight Against Modern Slavery”Thomson Reuters Foundation News, Nov 2016. Modern slavery is an urgent issue that affects thousands of people across the UK, and as a major hotel group we have the opportunity to lead the way in addressing this issue. By ensuring our staff and guests are aware of the risks, we can help to prevent modern slavery and ensure the safety and livelihoods of those who may be at risk. With these multiple entities involved at each level, this industry is particularly vulnerable to risk and the question is whose responsibility is it to drive out slavery and human trafficking? The conclusion is very clear: we are all responsible.